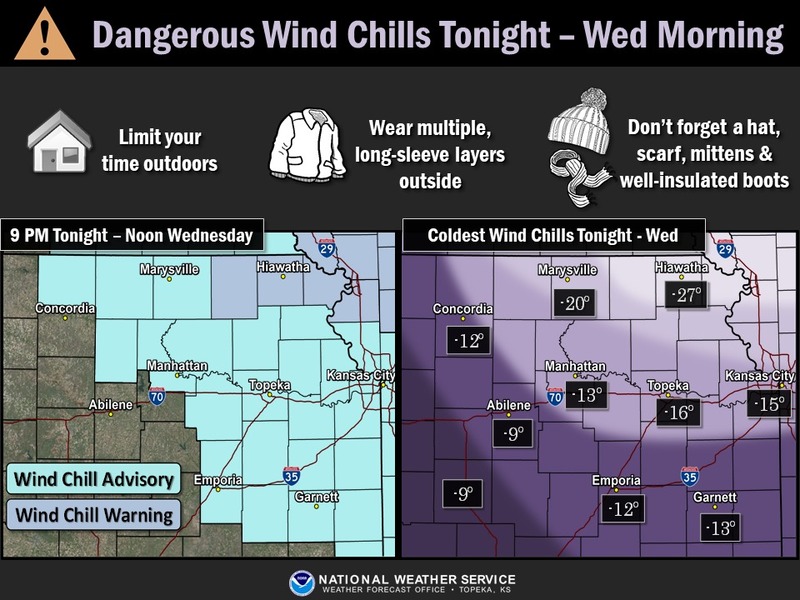 MANHATTAN — An Arctic blast will bring the coldest air of the season to portions of northeast Kansas, prompting wind chill advisories for Riley, Pottawatomie, Clay, Marshall and Wabaunsee counties from 9 p.m. Tuesday through noon Wednesday. Dangerously cold wind chills are expected, with some places seeing between 15 below zero to as low as 25 below zero wind chills. The immediate concern is that anyone exposed to these wind chills for an extended period of time will be at risk for frost bite and hypothermia if precautions are not taken. If you must venture outdoors during that time period, you should make sure to wear a hat and gloves. USD 383 Manhattan-Ogden is planning to have school Wednesday but advises parents to make sure their children are dressed appropriately for Kansas winter weather. Long pants, winter coats, hats, gloves, closed toes shoes. Parents have the right to keep their child or children home from school if they are uncomfortable with the weather conditions. We ask that parents to notify their child’s school. As for pets and animals, Kansas State University veterinarian Susan Nelson says they should be brought indoors. 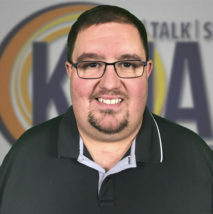 However, if that’s not an option, Kansas State University veterinarian Susan Nelson says clean straw makes good bedding and turning the pet’s shelter so it faces south or west and placing a heavy blanket over the entry offers added protection. She also recommends pet owners provide fresh water in a heated or plastic bowl several times a day and give them plenty of food. The cold blast will be out of the area by Thursday and gives way to temperatures warming up into the 50s by the weekend.